George Bernard Shaw: writer, raconteur, visionary, socialist and, as we learn in “Engaging Shaw,” ladies man. Yes, the ladies love Shaw, but not in the carnal sense. This is Victorian England after all. And what’s not to love? Shaw is brilliant, erudite and so self-absorbed and arrogant he’s charming. Women swoon. Smartly written by John Morogiello, with some assistance from Shaw, “Engaging Shaw” is a very amusing window into Victorian mores and the many facets of affection. Shaw, played ably by Rod Brogan, is sharing a cottage with Beatrice (Natalie Gold) and Sidney Webb (Michael Warner), his partners in both Fabian socialism and the founding of the London School of Economics. The latter is on tenuous financial ground, and the Webbs seek a benefactor to help them through. Secretly, Beatrice seeks a woman to bring Shaw to ground. Enter Charlotte Payne-Townshend (Angela Pierce), a wealthy spinster. Like Shaw, she spurns marriage but, as the story progresses, she too succumbs to Shaw’s magnetism. Payne-Townshend pursues Shaw with capitalistic fervor, dispatching competitors and slowly making herself indispensible. Shaw is alternately conciliatory and resistant, not wanting any woman to “clip his wings,” but also liking the attention. The play revolves around the one-to-one interactions, which sparkle under Henry Wishcamper’s direction. The Webbs share a dry but slyly passionate relationship. Charlotte and Beatrice alternate between collaboration and deep mutual discomfort. Shaw and Payne-Townshend engage in verbal duels and she, for the most part, keeps up her end. The production’s strength lies in Brogan’s bratty and often hilarious Shaw. It loses comic energy whenever he is offstage. However, Gold and Pierce have great chemistry in their sisterly confidences and disagreements. Warner plays Sidney Webb with a profound stoicism. His comic flourishes are quite satisfying for being completely unlooked for. The costumes and sets are finely done and the “rain” in the second act is brilliant. The lighting is a bit aggressive in the first half but is suitably tempered later on. 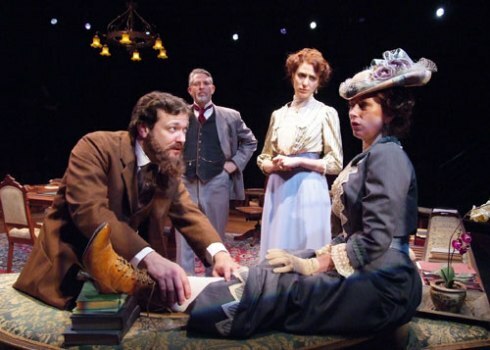 Overall, “Engaging Shaw” is a funny, enjoyable journey into George Bernard Shaw’s psyche with an interesting side commentary on women’s roles in Victorian society.